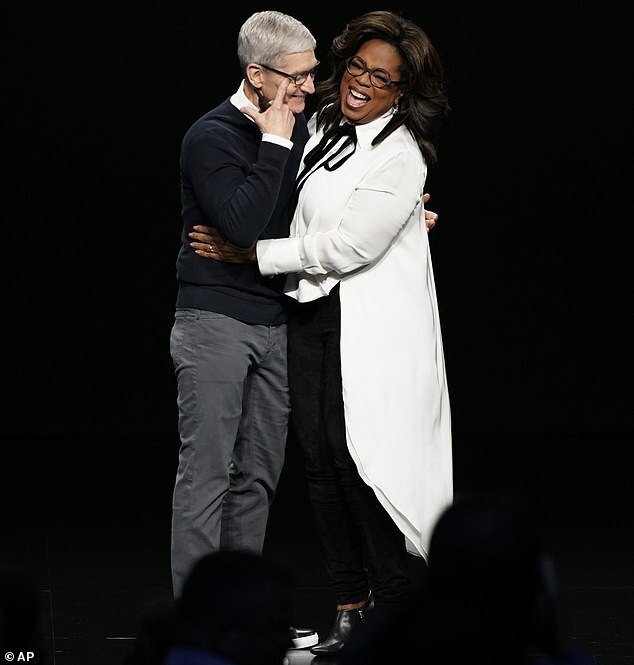 She wasn't expect to be there, but Oprah Winfrey shocked the audience when she appeared at Apple's It's Showtime event Monday in Cupertino, California. 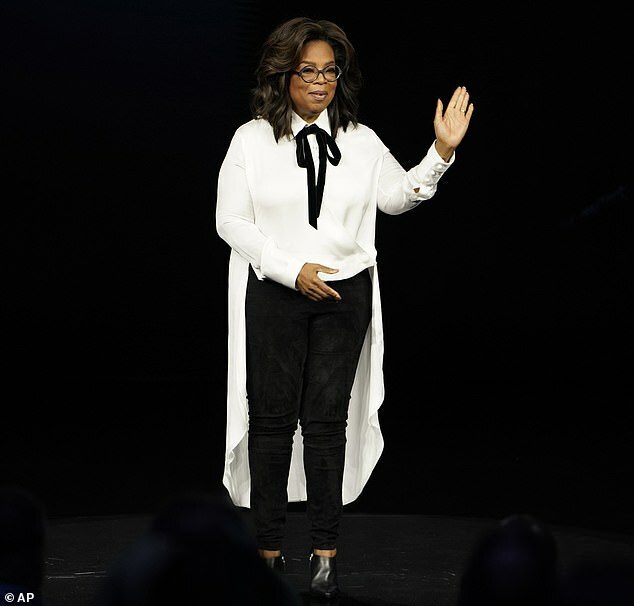 The 65-year-old daytime TV icon appeared on the event's pitch black stage to unveil a slew of new project for the upcoming Apple+ streaming service. 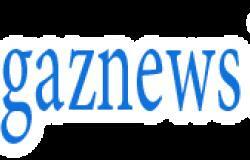 In addition to two new documentaries, she announced a revamped video version of her popular book club. She appeared in a white shirt jacket with a long, thin bow tie, black slacks and a pair of short black boots. 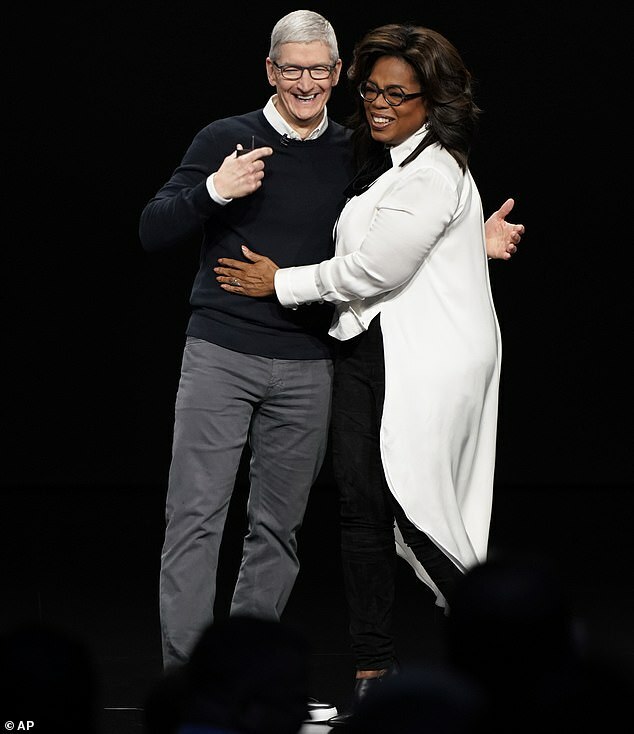 Oprah spoke in dramatic language about the importance of her new projects with Apple. 'There has never been a moment quite like this one. We have this unique opportunity to rise to our best selves in how we use — and choose to use — both our technology and our humanity,' she said. After the preamble, she got down to business, announcing a new documentary she'll be producing tentatively titled Toxic Labor. Oprah also has a multi-part documentary series in the works that's currently untitled, but will focus on the impact of mental illness.